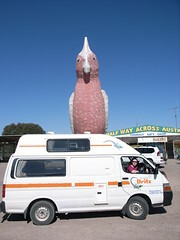 It took 3 days to get here but we finally got to see the highlight of our trip...a giant galah! Luckily Bianca didn't have to get out of the van as I could show her the picture when I got back inside. Oh you can see our trusty steed here too.